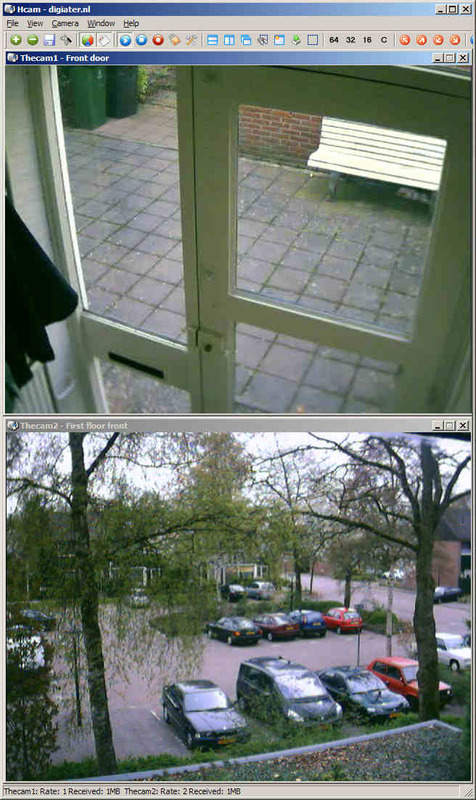 Hcam is an application for viewing pictures from one or more network camera's made by Intellinet (type 550710 or 550291). The accompanied Multiviewer application is very limited in it's capabilities to adjust and optimize the pictures the right way. With this program it's possible to show an unlimited number of camera pictures in various windows, where every window can be adapted for everyone's taste. All pictures can be shown in individual windows or full screen. This program has only been tested with the 550710 and 550291 cameras. Other types from Intellinet may work as well, but have not been tested. Version V2.1 is out now. Major changes are support for Mpeg4 cameras (like the 550291), handling of screensaver and power management, saving pictures, and better performance on multicore processors by separating camera handling, picture decoding and display into separate threads. A couple of bugs have been fixed too, especially in screen handling under Windows 7. The only restriction at this moment is that an Mpeg camera needs to deliver the data as a Jpeg stream. This will be fixed in the next release. A lot of things have been changed like running with different profiles, getting screen copies, etc. It has been tested on Windows XP, Vista and Windows 7 (32 and 64 bits). You can view the help here. Hcam is Freeware. The installer will install it into it's own map and add a shortcut, but the program can run standalone on any Windows version starting with Windows XP. You can download Hcam here.